Description: The Simpsons game was first released back in 1991 on arcade machines. It was an amazing fun game to play alone or with 4 players. Based off of the classic popular TV show. This game is an awesome beat em up. travel through levels and fight famous villain bosses from the show. Select from 4 characters. 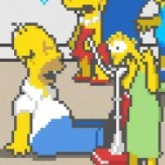 Homer, Bart, Maggie and Lisa (Note: must set up other controls to play more characters. Game Controls: Shift Key = In-cert Coin. Enter Key = Start. Arrow Keys = Move. Z Key = Hit. X Key = Jump. See In-game Controls for more options. To play as other characters you will have to set up controls for another player as it is emulating the arcade machine.By Default Only Marge will be playable, until you set up controls for player 2, 3, and 4.